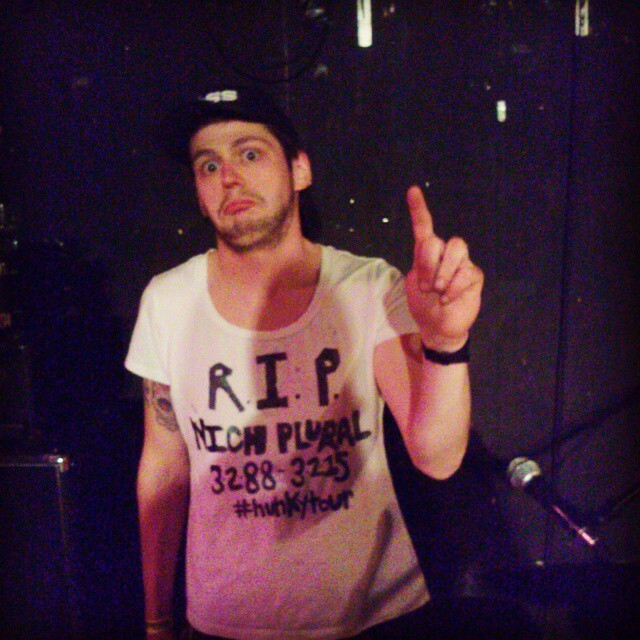 Tommy Plurals says: The Plurals have released quite a bit of new music in the last few months! Seriously! Yes, we put out the EP Chazzwazzers as well as a few compilation tracks in December 2014 (round-up below) but today some more new Plurals music is getting to the world, courtesy of Infintesmal Records, a label in Jacksonville, Florida. Jimmi, the mastermind behind Infintesmal, asked us just a couple weeks ago if we had anything lying around as he had decided to do a “March Madness Singles Series” featuring a new single every day for the second half of March and he wanted to feature some Plurals music. Since we had just cleared out a lot of our backlog with Chazzwazzers and the comp songs we weren’t sure what we could contribute at first but after some deliberation (which took awhile because Nich was on tour with Hunky Newcomers) we figured that we could release a song that we recorded for the new album that didn’t make the final tracklist called “Marigold.” We set the song aside after it didn’t fit the flow (we recorded 18 songs over the course of the album sessions and there are 12 songs on the album, so…) and weren’t sure exactly where we would ultimately release it but I’m glad this is where it’s going to be heard. The song just sounds like spring to me – wistful, epic, kinda watery, mostly fuzzy… yeah… – so beginning this new phase of the label and the season as a whole with it seems right. For the b-side we settled on “Wonderful Way” which had its first life on the 2011 Snohawk but since only a handful of people would have that at this point it seemed like a good idea to give it another shot. This song has always been a personal favorite of The Plurals and as far as our “studio creation” songs go this is one of the best: dreamy vocals by Hattie, singing from the perspective of a tree, with Nich doubling on organ and bass while I mostly stay out of the the way with guitar texture stuff… it doesn’t get much better for me. In December we also released a new song called “Winter Break” on the annual Bermuda Snohawk compilation. This song was originally envisioned as a jokey song about having a crush in high school but like most of our jokes ended up being more sincere and reflective of such bygone unrequited feelings. Mostly, it’s a catchy tune. Right around the same time that “Winter Break” came out we also had the pleasure to be featured on a compilation released by Dirt Cult Records featuring bands covering songs written by Todd Congelliere. Todd C (as the kids call him) is the man behind Recess Records and also has the frustrating-to-the-rest-of-the-world distinction of being a part of several bands that are all great: FYP, Toys That Kill, Underground Railroad to Candyland, Stoned At Heart, solo projects and more than that I’m sure. We covered a song called “You’ll Hear My Voice” that has been released by Todd solo and the band Stoned At Heart. The other bands on this comp are pretty sweet too: Low Culture, Iron Chic, Brokedowns, and more… including some guy named Mike Watt. The new album will be out in July. I mean it this time, I know I’ve said it would be out soon before but right now I’m waiting for a reference lacquer master from Lucky Lacquers to show up, as in today. And once the album is out there will be a lot of touring. Stay tuned! This entry was posted in GTG Records, The Plurals and tagged GTG Records, Infintesmal Records, Marigold, rant, Snohawk, The Plurals, Todd Congelliere, Winter Break. Bookmark the permalink.